FIND OUT MORE or PRE-BOOK NOW! How is the CLIL Course structured? Based on a mix of theoretical and practical lessons, the programme of the course aims at developing appropriate skills and knowledge about CLIL methodology. 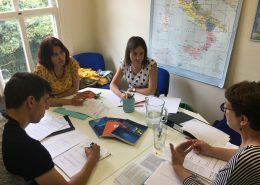 We also organise visits to British primary and secondary schools or vocational colleges to observe lessons based on CLIL and talk with teachers as part of the programme (*during term time only). 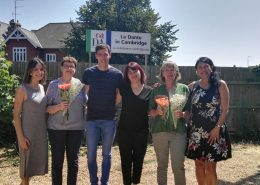 European Union Erasmus + funding for teachers: La Dante provides European Union funded CLIL programmes in the UK, offering teacher development courses for teachers using CLIL methodology. Click here to find out more about European Union Erasmus + funding to attend a teachers’ course in the UK. This two-week intensive programme is aimed at secondary and higher Education teachers who have to deliver content lessons in English. The aims of the course are to clarify and ‘demystify’ the concept of CLIL and to focus on specific areas of language development for classroom management and tuition. We demonstrate teaching techniques which are transferable to a variety of subjects across the curricula. We also show how published and authentic materials can be adapted for CLIL lessons. During the course, participants are exposed to a range of teaching practices and methodologies. This can include the following: planning and prepare a unit, demonstrations of lessons using CLIL methodology; adapting and exploiting texts in the context of CLIL; monitoring and evaluation of published materials and resources; specifically tailored sessions on language improvement. The course includes daily practical sessions in the morning preparing CLIL’s micro lessons and, in the afternoon, each participant delivers the micro lessons in small groups with peers work. This practical approach will give you all the skills you need to apply the learned methodology. Methods similar to ‘show and tell’ for history and geography, science and art. Teachers will provide the bibliography of extra texts and samples of lessons you can reproduce in the classroom.